Take Advantage. Bet with DailyRoto! We offer a suite of betting tools and products using advanced mathematics and data science to help the casual bettor find their edge. Access our game simulations each week of the NFL season or leverage our player projections to find opportunities in the prop betting markets. We also offer insights from some of the top experts and host contests where you can compete for swag, packages, and more. 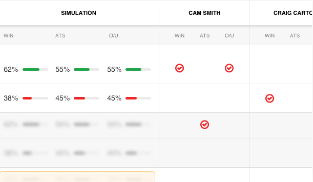 The betting simulation will use historical data for the team combined with our own proven DFS adjustments to predict the likeliest game outcomes. It will allow the user the freedom to adjust the team tendencies as well. Our games with 1+ point edges historically win against the spread at a 56.3 percent rate while our games with 1.5+ point edges hold a 62.7 win percent. Research all games to find your edge. Nobody puts more time into predicting player performance than our team of DFS pros. 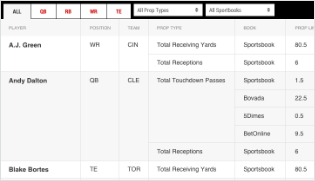 Leverage the player projections from our team of experts and compare them easily to player props across a number of sportsbooks and statistical categories. Each week Gabe Morency (@sportsrage) and a team of industry experts will compete against our simulations on SportsRage Against the Machine. Access picks from Gabe and some of the most popular names in the industry. 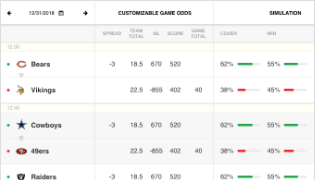 We’ve partnered with DataGolf to bring you a full suite of golf betting tools. Outright betting, Top 20 bets, H2H and 3BALL tools and much more. Betting Tools are coming soon! Enter your email and we'll notify you on launch.